Are You a New Business, Just Starting Out? When you are just starting a new business, there are many things to worry about in getting the business off the ground and running. Often, business signs are one of the last things to be handled, yet it is one of the most important in letting your customers know how to find you. Pinnacle Custom Signs is a full-service, commercial sign company that has you, the customer, in mind. It is our goal to be your one-stop-shop for all your signage needs. We provide a full array of products and services to help you get started and will do our best to stay within your budget. If what you’re looking for is not listed above, please browse around our website, as this is just a sample of our offerings. Also, check out how we helped Chimney Up Cafe and Ivy Springs Manor open their businesses in our Customer Projects section. If you’d like for us to contact you about your signage needs, please complete the form below and click the submit button. Or, you can call (678) 714-8700 and let us see how we can help you to get your new business noticed. What actually goes into the sign making process? For starters, creating a sign is different for almost every customer as there are several stages that go on behind the scenes, and not all the stages apply to every sign. It is important in the sign business to educate our customers about not only the materials and their optimal uses, but also about the process so that they fully understand it, ensuring good communication between all parties. There are several stages we go through to make sure that your sign meets your needs and will attract customers to your business. Depending on the type of sign(s) you are looking to purchase, you may or may not go through all these stages. Design Proof showing how we take a site survey, create a proof and show how it is attached for permitting process. A new customer comes to us in several ways. They can call in, walk in, make a request through the web, or have been referred to us by a friend or business colleague. During this stage, we get a general idea of the scope of the project such as the type of sign, the materials they would like to use and what the customer is looking to achieve with it. We also try to get some idea as to their budget for the project so that we don’t propose a solution that is unattainable. A site survey is often required to get a clearer picture of the scope of a project – to see where the sign(s) will be installed and identify any potential issues that might need to be taken into consideration from both a design and installation perspective. The site survey also helps us get the design process started by taking pictures of the job site and any measurements that are needed. Finally, the site survey also gives us the opportunity to more fully understand our customer’s vision. Once the site survey is completed, a work order is created and the design process begins. An initial proof is created with all the measurements and pictures taken which allows us to better estimate the costs of the final product. The proof gives the client a sense of what the new sign will look like when the projects is completed. It will often go through a series of revisions until the customer is satisfied with the final look. 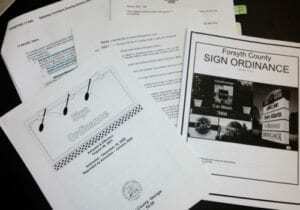 Sign Ordinances have different requirements depending on the jurisdiction the sign will be installed. It is important to know the code at the early stages of design. Permits are usually required for most outdoor signs. Permits are a necessity to ensure that signs and advertisements compliment the attractiveness, safety, and legibility of the environment by both day and night. Some municipalities are stricter than others, so it’s important to know and understand your jurisdiction’s policies in order to construct a sign that is to your liking and that also abides by the sign codes. The permit process takes place once design work is completed since most municipalities require diagrams showing how and where the sign(s) will be installed. Permitting can be done by either the customer or can be done by the sign company, often for an additional fee. Once the design has been given the green light and if a permit was required and has been approved, then production can take place. Depending on the type of sign, different production processes will be followed. In-house production includes printing, cutting, weeding, mounting, painting, routing, and/or engraving. For other types of signs, we do not have the equipment to produce and we outsource the job to one of our vendors. Coordination is key in these situations to make sure all parties are on the same page. On jobs that require a bucket truck for installation, we sub-contract the work to one of our partners. Once production is completed, and before installation takes place, a quality review is vital in making sure that everything turns out the way it is supposed to and that no damage has been made to the material. After this is checked, our team will either perform an in-house installation or have sub-contractors complete an out-source installation if the sign requires special equipment such as a lift or crane. What most people don’t realize when they purchase a sign is what it might take to bring their vision for their new sign into fruition. While some signs are rather simple and easy to make such as banners and many interior signs, others require quite a bit more work to get the sign created to meet the needed requirements. This work can include site plans, engineering drawings, knowledge of sign ordinances, etc. These things can make the process a little more difficult and time-consuming. Either way, it’s always important to keep the lines of communication open with the customer, keeping them in the loop throughout each stage of the process. In Early October of 2013, we were contacted by Renee L’Eplattenier. 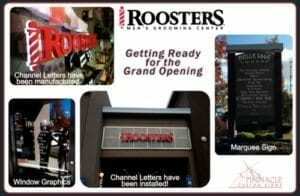 She and her husband, Ross Christian, were opening up a new upscale barber shop called Roosters in Sandy Springs, GA. They contacted us to do several types of signs, such as some window graphics, a grand opening banner, a marquee sign and their lighted building sign. 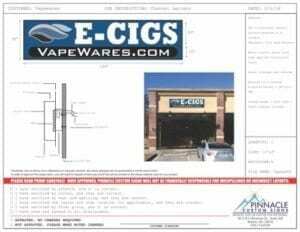 However, with the latter, they were moving into a shopping center where the landlord had very specific requirements for the signs that would be allowed for each store. For the suite that they were renting, the landlord required back-lit channel letters on a raceway. Back-lit channel letters are different from regular channel letters in that the lighting shines out the back of the letter and reflects off the surface behind it. These types of signs are also sometimes referred to as “halo” signs due to the effect that the lighting has coming from behind the letters as shown in the picture below. They give a much different look than normal channel letters, where the light shines out the front of the letters. Our design team worked extensively with Renee to come up with the best design that would be approved by the landlord, the franchisor, and the city. After 30 days of extensive design work, we were finally ready to start the permitting and manufacturing process. The unfortunate part was that the design process took such a long time that the manufacturer could not guarantee the sign would be completed before their ribbon cutting, scheduled with the city on December 10th. Because of the short timeline, we worked closely with the manufacturer on a daily basis to see if he could move things around and get the sign to the customer by their big event. After much work and rearranging of priorities, we were able to get their sign manufactured and installed on December 9th, in time for their Grand Opening. 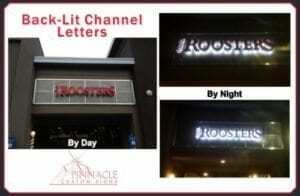 As you can see, there are different options to having lighted channel letters on your building. Your sign company can help you determine the best type of sign for your building that will give you the best exposure and attract customers. We would be glad to help you get your name in lights. Just give us a call and ask for your free estimate. In late 2011, Ivy Springs Manor, a new concept in assisted living and memory care, broke ground to build their new facility. By Spring of 2012, they were finishing the final touches in time for their grand opening. 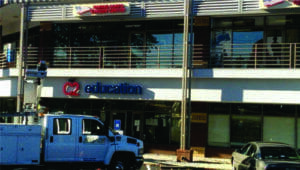 During the final stages of construction, they enlisted the help of Pinnacle Custom Signs to help with various signage needs. Some of these needs were simple signs that directed prospective residents to the Sales Office when an Agent was on duty, or those which marketed special events and tours to show off the new facility. However, there were two projects which were the highlight of readying their facility for their Grand Opening: one was wrapping their bus that will be used to transport residents to various activities and the other was providing interior signage for their community rooms throughout the facility. The owners of Chimney Up Café first came to us in October of 2011 with the challenge of creating new signage for their new business. The first order of business was to create a banner to be used outside the shop to let people know that the business would be opening soon. The next step was to of get their more permanent signs designed and created. For this, several different types of signs were needed. First and foremost, the marquee at entrance to the shopping center needed to be updated to include the name of their business. They also needed a more permanent sign on the outside of the shop. For this, they wanted lighted channel letters with a lighted logo. They also wanted to have some sort of window graphics to capture the attention of customers to their shop using an image of a chimney cake as well as their new logo. Lastly, we also provided some indoor graphics to help in decorating the inside of their establishment. In November of 2012, just about a year after they opened for business, they had decided to move the café to a different location. They came to us to see if we could once again help them, which, of course, we were happy to do. In this second project, we helped with the movement of their lighted logo sign from the old location to the new one. Additionally, we enhanced it to make people more aware of what they did. We also provided them with “Coming Soon” banners as well as some decals for their interior.